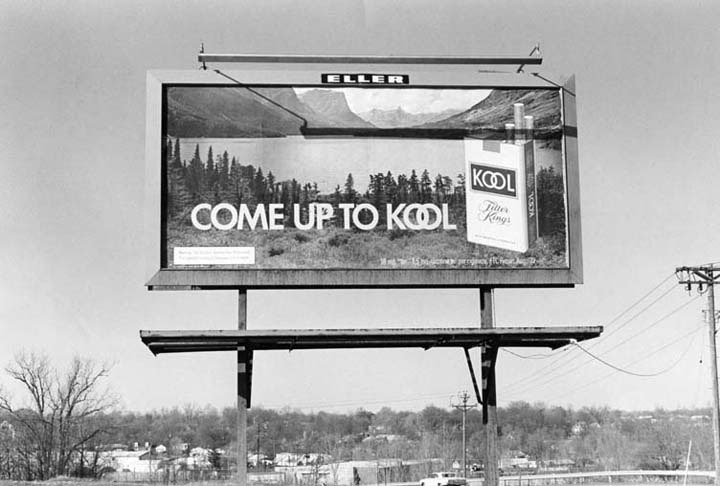 “Come Up To Kool” was an early verbal-visual outdoor encounter. The artist would scour the streets of St. Louis on a bicycle, his Nikon bulk-loaded with black-and-white film. He was looking for surprise encounters, but also trying to observe himself observing, to understand what he chose to notice and why. He was attracted by imperative messages to do or be something, intrigued by the absent instructor a decade before he had read anything in the postmodern literature about “sign and the signifier” or “simulacra” or “deconstruction.” The context of these signs soon began to affect the way he photographed them — like the shadows on the posts under the sign appearing to make the sign rise from behind the horizon line.